Before we delve into my pick for one of the most effective exercises for abs and sing praises for hanging leg raises, I would like to preface the article with three important points. Firstly, exercises that greatly engage your abdominal muscles are often exceptionally difficult and thus tend to require some degree of base strength or pre-training before being able to execute them correctly and effectively. Secondly, there really is no such thing as a ‘best exercise’- hanging leg raises may stimulate your abdominal muscles more than crunches, planks and leg raises but they are not your best choice if you can’t do them properly. Thirdly, the most effective abdominal exercise, executed perfectly on a regular basis still won’t give you a 6 pack. A sleek midsection, rippling with muscle comes more from your diet and what you do to reduce body fat in terms of energy expenditure, but you won’t burn much of anything training the relatively small abdominal muscles, regardless of how intensely you train them (See my article- Getting The 6 Pack- It’s More About What You Eat Than What You Do). That being said, abdominal strength is an important component to the execution of almost every athletic movement and strong abdominals play a stabilizing role in just about every physical activity we undertake. Strong abdominals are also key to proper posture and the prevention of back injury, aspects of physical fitness that far outweigh the cosmetic and relatively superficial pursuit of having washboard abs- which, by the way are no indication that your abdominal muscles are necessarily strong. Top Olympic lifters and powerlifters have some of the strongest human abdominal muscles on the planet, but due to their body fat distribution they seldom have anything even remotely resembling a 6 pack. In this article we take a look at my recommendation for the most effective abdominal exercise- the hanging leg raise- and discuss why I picked it, how to do it correctly and how to work up to it if you aren’t able to do them at this point. It’s a difficult movement to say the least, but if you work up to it you will be rewarded by ultra-strong abdominals. Thanks as always for reading and do be sure to share the article with anyone you think might benefit from it. When choosing an exercise it’s always best practice to first understand how a muscle works in real life and its basic anatomy. Most abdominal exercise recommendations focus on movements that isolate the abdominal muscles as much as possible- a practice that I generally tend to disagree with since isolation movements not only confer the least amount of stress on the abdominal muscles but also are the furthest removed from what we would do in real life. Abdominal muscles are designed to be used in conjunction with other muscles in our body and so for the best results in terms of increasing strength and muscular development the muscles, it’s best to do more inclusive compound movements, rather than isolating ones. Along with their role in breathing and protecting our organs, it is useful to think of the abdominal muscles as an extension of the spine and consider the two as part of a whole. When we think about ‘abs’ or a six pack the muscles that first come to mind are the rectus abdominus- a slender muscle that runs across the abdominal wall and originates (starts) on the crest of the pubis bone and inserts (ends) on the cartilage of the fifth through seventh ribs. Muscle fibers in the rectus abdominus run parallel to each other and the left and right pairs are separated by a strip of tendon called the linea alba. The muscle fibers are further separated crosswise by three tendons called linea transversae. Separations that create the blocks or six pack that is readily apparent in someone with well-developed abdominal muscles and minimal body fat in their mid-section. While not directly connected to spinal movement, deep behind the rectus abdominus is another layer of muscle called the transversus abdominus, originating from the outer inguinal ligament, the iliac crest and the cartilage of the lower sixth rib and lumbar fascia and inserting on the pubic crest, iliopectineal line and the linea alba. The transversus abdominus serves to hold in the viscera and protect our inner organs and is a responsible for helping you maintain a flat looking stomach and in breathing out forcefully. The transversus abdominus, also play a role in spinal stabilization and posture. On the sides of the rectus abdominus are the external and internal obliques. The external obliques start in the lower ribs and the front half of the ilium and end at the lower end of the linea alba. The internal obliques are found under the external obliques, originating in the lumbar fascia, the frontal crest of the ilium and the outer half of the inguinal ligament and inserting in the cartilage of the ribs and linea alba. 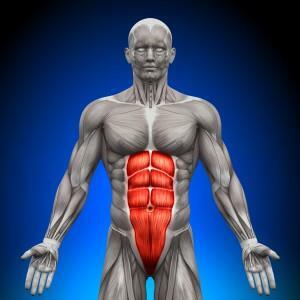 As we mentioned before- it helps to think of the abdominal muscles as a part of the spinal system as the rectus abdominus allows for spinal flexion (bending forward) by contracting and moving the ribcage down or by pulling the pelvis up. The external and internal obliques also play a part in spinal flexion as well as in rotating the upper and lower trunk and lateral flexion (bending sideways to the left or to the right.) All of the aforementioned muscles also help maintain proper posture. If we understand the way a muscle works, its origins and insertions it becomes relatively easy to determine which movement would be best of increasing overall strength and development. It is always interesting to me that many experts in the field recommend using compound movements over isolation type exercises when it comes to strength training and muscle development but somehow forget these basic principles when it comes to training abdominal muscles. A deadlift for example, is an ultra effective strength building exercise and overall recommendation for muscle development because it engages so many muscles at the same time- much in the way an individual would doing a real life movement. A bent leg deadlift works the hamstrings, gluteus maximus, erector spinae, the quadriceps, as well as the abdominals, forearm and upper arm muscles- a synergistic movement that gives you the most bang for you buck (so to speak) by allowing you to not only work several muscles at the same time, but also place a significant degree of overload in a safe and controlled manner. That being said, as deadlifts and squats are considered standard compound movements that should be done by anyone serious about maximizing overall muscle strength and development (providing injury or structural limitations don’t present any restrictions) the hanging leg raise is recommendation as the best bang for your buck exercise for your abdominals. For an exercise to be considered a compound movement, it must engage as many muscles as possible being targeted in a way that allows for muscular overload to take place safely. Within the realm of high intensity training, the philosophy has always been about selecting not only the most effective exercises with regards to strength and muscle development, but also the ones that increase flexibility and offer the most in terms of real world strength application. Weight lifting has often been criticized as being somewhat 180 degrees away from flexibility promotion and while several poorly trained and chemically enhanced over muscled individuals may stand as living testaments to this myth- proper exercise selection can do wonders in terms of increasing overall flexibility. Weight training, by it’s very nature, places significant stress on your spinal column and thus it is important that there are exercises in your routine that allow you to stretch the spine and the muscles surrounding it- and hanging leg raises is just the ticket. Now there are many variations to the hanging leg raise- some involve straps or a specially designed chair?? For the purposes of this article we will focus on the hanging leg raise in its purest form where you are holding on to a high bar and bringing your toes to your hands. It’s a basic movement that can be done anywhere- the gym, a playground or anywhere there is a bar you can hang from and offers tremendous benefits in terms of strengthening not only the abdominals but all the several supportive muscles as well. They work other auxiliary muscles that you would use for an abdominal contraction such as the iliopsoas and pectineus muscles of the hip as well as the rectus femoris of the legs, . They develop the muscles required for proper spinal posture while also allowing the spine to stretch during the movement. The movement requires abdominal contraction from the beginning to end while keeping the lower back in a safe position, thus making it a safe way to develop both abdominal and the supporting hip flexor muscles. The lowering (eccentric) phase of the exercise places significant stress on the muscles of the abdominals given the weight of the legs when they are kept straight. 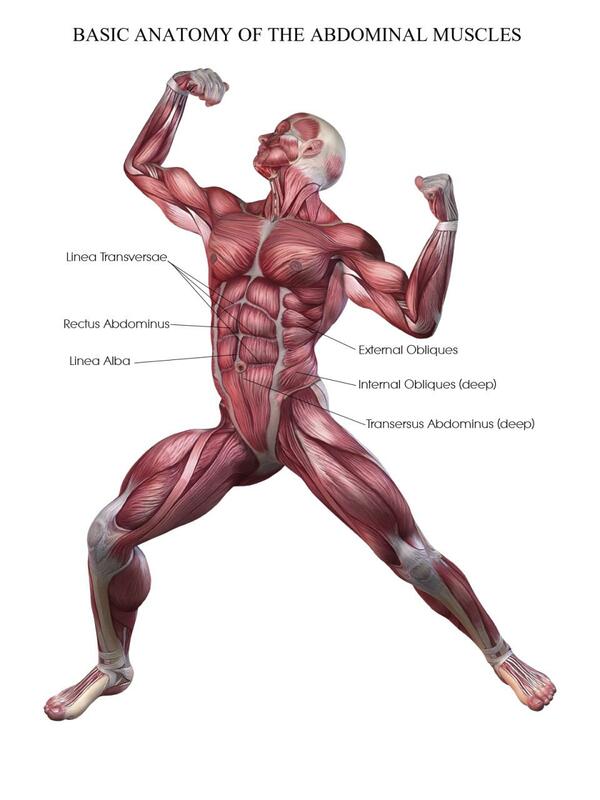 Maximal increases in muscle strength and development (hypertrophy) come from the negative phase of an exercise when the muscles stretch under tension and few other abdominal exercises allow for such a high degree of muscular overload in the negative phase without putting the lower back at risk. In essence, the hanging leg raise, when properly executed through a full range of motion to the point of overload and or momentary muscular failure, can allow for maximum muscle and strength development in the major muscles of the abdominals in a way that few other exercises can replicate. Such a high degree muscular stress is not possible even in weighted machine abdominal exercises. Crunches, a standard abdominal exercise, do not allow for a full range of motion when compared to a hanging leg raise as there is only limited range of movement of the head and shoulders no more than 20 degrees off of the floor. Crunches also primarily engage the upper rectus abdominus which pulls the ribcage towards the pelvis, but not the lower abdominal portion that pulls the pelvis towards the ribcage. Hanging leg raises engage the muscle through both ranges of motion. Now as we said earlier, hanging leg raises are not an easy exercise, however there are variants that use to help you work towards being able to do them. Doing a hanging leg raise by bringing your knees to your shoulders instead of keeping your knees straight and bringing your toes to your hands can decrease the resistance on your abdominal muscles significantly- however it remains an effective abdominal exercise nonetheless. Most people start out doing hanging leg raises this way before graduating to the straight leg version- which should always be the ultimate goal. Supported straight leg or knee raises on a vertical bench is another variation of the hanging leg raise where the forearms are supported, and is another excellent starting point. Some may even find this variant somewhat difficult, however it does not allow to maximally rotate your pelvis inwards the way you would with straight leg hanging leg raises and thus the abdominal contractions will not be as strong and it will focus more on the lower rectus abdominus region. Several companies also make parachute like straps that go under your arm pits which can make the hanging segment much easier and focus more on your abs. That being said, it’s not as effective for increasing overall upper body and grip strength and again the onus should always be on mastering this variant and doing your best to move up to the more advanced straight leg version. Hanging leg raises also require significant upper body and grip strength so be sure to work your upper body to prepare for them and you may need to use hand straps in the beginning. Don’t rely on them though as the onus should always being able to do the exercise without any aids so as to get the full benefit. Only after mastering the movement should straps be used extensively. While hanging leg raises are my pick for the most effective (and safe) abdominal exercise and it ‘s what I did more than any other movement early in my training career, it should be noted that muscle fibers adapt by getting bigger and stronger after being stressed by an overload that they are not accustomed to bearing (see my article on How Muscles Get Bigger & Stronger). That being said, no matter how effective an exercise may be, for maximum results you need to do a wide variety of movements that hit the muscles from as many different angles as possible. Crunches, reverse crunches, planks, reverse trunk twists and their many variations all have their place in an effective abdominal development routine. Injury and or insufficient muscle strength may also limit what you can and cannot do so the best exercise is always what you can realistically do. Keep in mind though, that without proper diet, you can do all the hanging leg raises in the world, but it won’t do a thing for that layer of fat round your midsection. For that you need to focus on a consistently proper diet. Combine the two, however and you’ll have a six pack in no time. Click To Get A Copy Of Kevin’s Free Ebook On The Role Of Exercise In Reducing Abdominal Fat! Featured everywhere from the Wall Street Journal to network TV, Kevin Richardson is an award winning health and fitness writer, natural bodybuilding champion, creator ofNaturally Intense High Intensity Training and one of the most sought after personal trainers in New York City. Learn more about his award winning personal training services here!